Delikon is a leading supplier of braided flexible conduit systems for routing and protection of electrical cables in vehicle wiring harnesses. We work extremely closely with vehicle manufacturers and OEMs in the development of flexible conduit systems to suit individual applications. Offering best design solution utilising our extensive range of interfaces mean we can often offer tailored and innovative solutions for almost any giving wiring application. 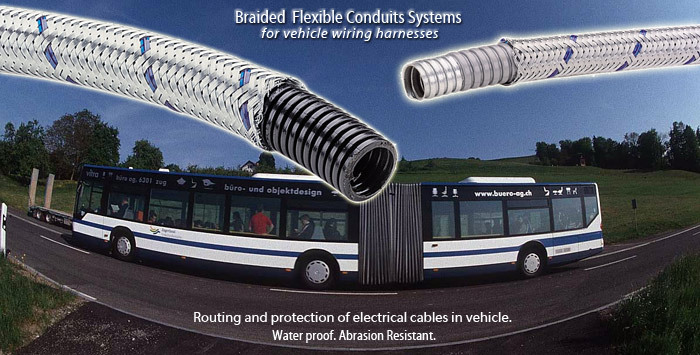 The conduit systems route and protect wiring in some of the most vulnerable locations on trucks and buses, trailers, diggers, agricultural vehicles, boats and construction plant. Ranging from dust tight conduit through to completely water sealed systems, they also provide stability and support to the harness guarding against undue movement and protecting against water ingress. Delikon works closely with specifying engineers at OEMs, harness and connector manufacturers in developing cost effective, problem-solving solutions for the highly competitive automotive markets. These include the highway, off-highway and industrial vehicles sectors.